Football film today! I love football and I love football films. Of course, I don't love all football films. I really hate it when a film gets something wrong or asks its audience to suspend its disbelief too much. If I'm watching a sports film I want the sports parts to look like sports. 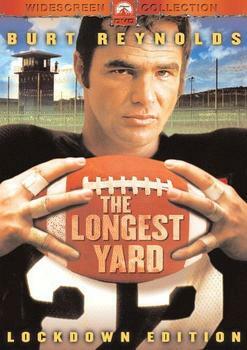 Luckily The Longest Yard didn't do anything like this to piss me off. I really enjoyed today's film. 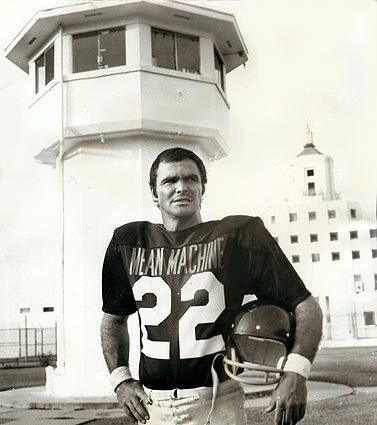 It had football, a car chase and Burt Reynolds. Where could it go wrong? I was surprised by how violent it got at some points. For example, when Caretaker is killed, I was really taken aback. It was a harsh reminder that these guys are in prison because they are bad people who have done bad things. I think that's one of the things that made me like the film so much. It is so funny at times and then it can quickly get serious. 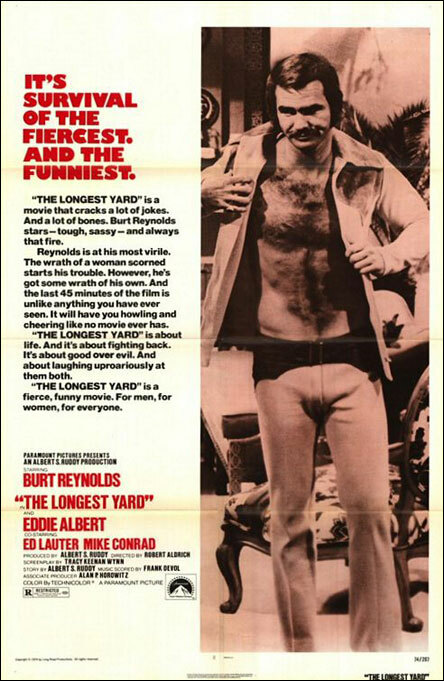 There is the murder scene and at the beginning Burt Reynolds attacks the woman and throws her to the ground. There are even slight moments like when they're in the file room. They're going through the records on the inmates and listing off some of the things they did. I liked that it could balance those funny and really serious moments well. The football scenes were good too. I jumped up at one point and was screaming at the player on the screen saying, "Go! Go! Go!" Allison watched the film with me and at this point she looked at me and told me it was just a movie. I can always tell when a sports movie gets the sports parts right because I usually end up standing on furniture yelling at the tv. I'm sorry about the trailer today. I couldn't find the actual film trailer but I found the one for the DVD. All I found film related were a bunch of clips from the movie and the trailer for the 2005 remake. I have to say even though I haven't seen the new one, I am pretty sure I would not like it. I'm not a huge Adam Sandler fan, in fact I usually hate his films. We saw the trailer for this one before the film started and I kept thinking "man I hope the film isn't like this." And, it wasn't! I saw this film with Art several times. I really liked it and I think you got it right when you talked abbout the mixing of the reality and the sports. Allison needs to suspend her disbelief a bit more and recognize that a sports accomplishment it as real in a movie as an elf or wizard saving one of their companions. I'm willing to suspend disbelief all day long for a good flick - which this is - but I'm less likely than Amanda is to damage the furniture in doing so. I think it was less a "chill, it's just a movie, it's fake" comment and more a "chill, and no more sugar for you today" comment.